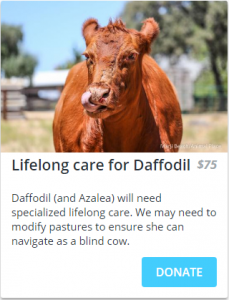 Time was running out for two close friends — a 10-yr-old miniature cow Azalea and 7-yr-old blind Daffodil. The property owner where they lived wanted to plant grapes and offered the two cows up for onsite slaughter to one of his workers. We refused to let that happen! A volunteer drove several hours to pick up the cows. When they stepped out of the stock trailer, we were shocked by their condition. While most of our rescued animals arrive emaciated from neglect, these two cows were suffering the side effects of too much food and lack of space for exercise. 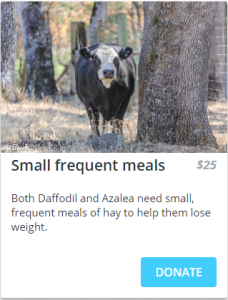 Your donation of $25 will cover the costs of the frequent (but small) meals Azalea and Daffodil need in order to start on their long road to losing weight. It might surprise you, but feed restriction is a bad idea for cows in need of weight loss – frequent small meals that help keep them full, along with exercise, are the best options for these two. Your gift will help them feel full without adding more pounds. Azalea is 200 pounds overweight and suffers from foot lesions and front leg arthritis. Daffodil needs to recover from a traumatic injury that occurred at the farm prior to her arrival. Given time, her massive abscess and wounds will heal…but her greatest challenge is learning to navigate the sanctuary as a blind cow. When they first stepped foot on the sanctuary, it took several hours for Azalea and Daffodil to stop pacing. We all sighed in relief when the two cows finally lay down to rest. Our veterinarian assessed them both and stated Daffodil suffers from neurological damage due to a disease she likely had as a calf – she often leans to the left and finds it difficult to turn to the right. While there is nothing we can do for her, we know she may need specialized care as she ages. We are equipping Azalea with a collar and bell in hopes of helping Daffodil maneuver around their large pastures. Your gift of $75 will go towards Daffodil’s lifelong veterinary needs and ensure that all the cows at the sanctuary receive the medical care they deserve. While we are overjoyed that Daffodil and Azalea will spend the rest of their lives at Animal Place, you can imagine how hard this is for them. Azalea is 10 and Daffodil 7 and they recently lost their best friend of many years. On top of being moved several times, both are dealing with the grief of that loss. Supporting Daffodil and Azalea’s recovery means more than helping them lose weight and healing their physical wounds…your support helps heal those invisible wounds. Each day, we spend time with them and work to earn their trust. God bless you for your kind and beautiful hearts. The world needs more people like you. Soon they will realize they are FREE! And will have no need to over eat. Thank you for your love for the helpless. Please enable your Twitter and Facebook so that we can share these stories and hopefully, bring in more donations.